Although Russell and I celebrate Valentine’s day we have never made it a big deal. For our first Valentine’s day Russell and I were in college and, like most college kids, we were broke. We went to our favorite Mexican restaurant and enjoyed our beloved chicken fajitas. Since our first Valentine’s day we have continued to celebrate by having a nice dinner--but we prefer not to deal with the Valentine’s day rush that overruns most restaurants every year on the 14th day of February. This year I will be making a nice meal for us at home and, although it is still a few weeks away, I have already begun to plan the menu. 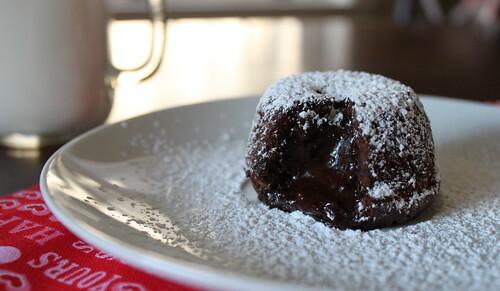 I’m thinking about making something with crab for our dinner; but for dessert we will be having these chocolate molten cakes. They are so simple to whip up and are quite tasty. They can be served with ice cream, whipped cream, or sprinkled with powdered sugar; no matter what they are the perfect end to a nice dinner. The first time I made these cakes, I over baked them a bit--so keep a close eye on them. You want the tops to look done, but jiggle a little when lightly shaken. The original recipe states to bake them for 10 minutes, but since my oven runs a little hot, the next time I plan to bake them for around 8 minutes. Preheat oven to 400 degrees F. Spray six muffin wells (and the surrounding tops) of a muffin pan with non-stick spray. In a medium bowl, beat the butter and sugar until fluffy, approximately 3 minutes. Scrape down the sides of the bowl and add the eggs one at a time, waiting to add the next one until each egg is fully incorporated. Mix in vanilla. Using the lowest setting, add the flour and salt until just combined. Add the melted chocolate until thoroughly combined. Fill each muffin well almost to the top and bake for 8-10 minutes. The cakes will look done on top but will jiggle if you slightly shake the muffin pan. Let the cakes sit for 10 minutes in the pan. Place a plate over the muffin tins and flip to remove the cakes. 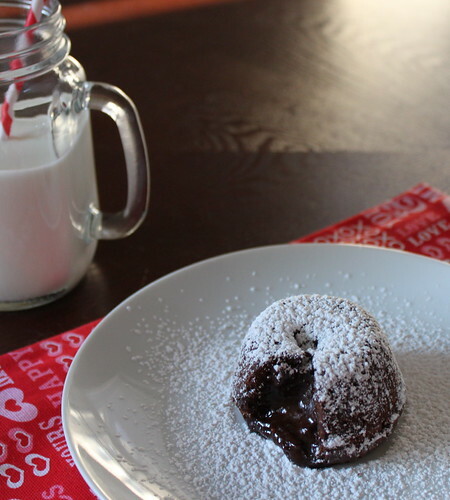 Enjoy with ice cream, whipped cream, or powdered sugar.